Each year, natural disasters threaten the strength and stability of communities worldwide. Yet responses to the challenges of recovery vary greatly and in ways that are not explained by the magnitude of the catastrophe or the amount of aid provided by national governments or the international community. 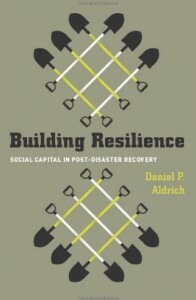 The difference between resilience and disrepair, as Daniel P. Aldrich attempts to show, lies in the depth of communities’ social capital. Roger McCormick contends this book is immensely readable, but recognises not all readers will be entranced by the significant amount of detail given to the author’s research methods. Building Resilience: Social Capital in Post-Disaster Recovery. Daniel P Aldrich. University of Chicago Press. August 2012. One of Bruce Springsteen’s recent barnstorming anthems is entitled “We Take Care of Our Own.” Although The Boss no doubt had other more noble things on his mind, this phrase (which, on analysis is somewhat double-edged) might have been used to sum up the not entirely healthy, nimby-ish and negative attitude of some of New Orleans’ citizens to proposals for temporary trailer accommodation in their neighbourhoods to accommodate those who had been made homeless by Hurricane Katrina. Taking care of your own does not necessarily include those from the wrong side of town. Mr Aldrich is associate professor of political science at Purdue University and has drawn on not only traditional research methods but also his personal experience of Katrina (he was at Tulane for a while) to write a fascinating account of how social capital networks tend to operate to deal with the aftermath of disasters. His book focuses on four specific scenarios: two major twentieth century earthquakes in Japan (Tokyo, 1923 and Kobe, 1995) the Indian Ocean Tsunami of 2004 (and its effect in Tamil Nadu in South East India) and Hurricane Katrina (2005). He opens with the interesting question that provides the underlying theme for the work: why do some communities, affected by the same disaster and with similar levels of wealth or poverty recover (as evidenced by, for example, by re-population) much more quickly than others? In New Orleans, for example, the district of Mary Queen of Vietnam within Village de L’Est had restored ninety per cent of its population within two years of the disaster whereas much of the Lower Ninth Ward (about 12 miles to the southeast) — five years later — “looks as damaged today as when the levees broke”. In Tamil Nadu, within a year of the tsunami, some fishing villages had folks back to work and had rebuilt houses but others “seemed to be off the map of aid relief”. How come? In the author’s view,and he provides much research evidence to support it, “social networks and connections form the core engine of recovery after even the most devastating of events.” In view of this, he suggests, government initiatives to help recoveries need to target less the rebuilding of physical infrastructure and more “local social networks and social capital”. Simple suggestions seem obvious, once stated. For example, ensuring that those in emergency accommodation are kept together in communities that are historically familiar with each other will pay vastly better recovery dividends than housing the newly-made homeless on a random basis — say, in “a tent city in a park in downtown Kobe” (an error made in that city in the post-quake period). This is partly due to the way that that important ingredient of social capital — trust — works in such situations. Recent World Bank research, cited by the author, “showed that trust magnified the effectiveness of foreign aid.” If you split people up from their friends and neighbours, you risk ending up with “a community of elderly and disabled people living alone” and such people will feel isolated and find the establishment of new friendships (and trust) difficult. They will not thrive. The author uses a number of proxies for establishing the existence of strong social capital. In the case of Kobe, he takes the existence of local non-profit public interest entities (including school, religious, medical and social welfare organisations) as an indicator and finds that in areas where these were more prevalent, the local inhabitants were more able to “organise themselves, not only immediately after the quake to fight fires but also over the rehabilitation period to set up ward associations…” They also restored population levels more quickly. In India, the equivalent organisations (for the tsunami study)include the “uur panchayats” (tribal or caste councils). These seem to be decidedly double-edged swords — highly effective deliverers for those deemed worthy of their assistance. Not so good for the rest. Other proxies include voter turnout and literacy. It is accepted, however, that “measurement” of the phenomenon is difficult, imprecise and may require different methods in different situations. There is ample room for differences of opinion here. The analysis places considerable importance on distinguishing three different types of social capital; bonding, bridging and linking. The bonding variety operates within a social group, typically a family or a group of friends and neighbours (or some larger group that has similar characteristics). Bridging social capital connects members of a group to outsiders, “…to extralocal networks, crossing ethnic, racial and religious cleavages.” It has been suggested that such bridging mechanisms, for example, cross-ethnic associations, can alleviate tensions that otherwise may lead to racially or ethnically based violence (such as the Hindu-Muslim riots in India, 1950-1995).Whereas these first two forms of social capital tend to operate amongst individuals of the same status, the third form, linking social capital, takes into account “vertical distance” and can work, for example, to link villagers with government representatives or NGOs who may be a source of post-disaster aid. The author cites evidence from Tamil Nadu of how the absence of linking can be harmful: villages potentially eligible for receiving the same treatment as everyone else in terms of aid experienced slower recovery if they could not access NGOs or government officials effectively. The book is a valuable, and highly relevant, contribution to the debates surrounding the social capital concept. It focuses on events that have almost literally rocked the world in recent times and that, sadly, seem to be on the increase. And it provides thought provoking ideas for how we might better prepare societies for such events and for their aftermaths. Throwing money at the problem, principally to bring in construction contractors, provide food and erect emergency shelter, may be a start but it is not enough. Social cohesion is invisible but has a value that must be preserved by more considered and targeted kinds of assistance. The book is also very well written and, as a result, immensely readable, although perhaps not all readers will be entranced by the significant amount of detail given to the author’s research methods. It tells us much about how the unfortunate victims of disasters cope with their consequences and how some fare better than others. In short, it tells us much about ourselves.